Mihee Kim-Kort | YoRocko! Mihee Kim-Kort – YoRocko! Note: Making Paper Cranes is a weekly engagement with Mihee Kim Kort’s New book . . . uh, . . . Making Paper Cranes: Towards An Asian American Feminist Theology. Mihee handles complicated things gently. Also, her fastball touches the low 90’s. In order for Mihee’s Asian American Feminist theology to move the needle, theologically, culturally, or ecclesially, she’s convinced that it must involve the risk of uncomfortable–even painful–collisions that move people’s real, physical bodies, to transformative action. The sources of identity for a woman of Asian ethnicity living in the United States are multiple. Being an Asian American Woman in a church context adds yet another source. Making Paper Cranes spends a lot of time tracing these identity sources and unfolding them for the reader’s examination. As a white American man working alongside Mihee in that same church context, there’s tremendous value in listening to her description of the collisions she undergoes. But also, as she describes the strain and the promise of “reconstruction,” I’m given new eyes to behold the value that my Asian American brothers and sisters in the church are contributing to our common life, value I was ignorant of before. For collision and fragmentation to resonate as metaphors, theology must be rooted in the physical and flesh-and-blood—in the mess and chaos of humanity. This theology of embodiment is grounded in the reality of God in Christ Jesus. It finds its roots in a doctrine of the incarnation of Christ that highlights the importance of apprehending Jesus Christ in a particular human, social context. This, then, becomes the basis for validating our own social histories and situations. We are able to view our own lives as the center and subject of stories rather than in relation or association to what is considered normative. The emphasis is placed on human experience in the body more than on abstract ideas of the mind as the starting point for understanding God, so body experiences are positively viewed as occasions of revelation. And so it is that I realize the errors of how I’ve been approaching this book, looking for analogies to my own experience instead of listening for the “social histories and situations” unfolded in its pages. Making Paper Cranes and its Asian American Feminist theology is not an abstract exercise in metaphysics or cultural anthropology. It’s one human beings testament of God from where she is, as who she is. Note: Making Paper Cranes is a weekly engagement with Mihee Kim Kort’s New book . . . uh, . . . Making Paper Cranes: Towards An Asian American Feminist Theology. Mihee handles complicated things gently. Also, she’s got deadly opposite field power. Here are posts one, two, and three about the book. Making Paper Cranes turns to theological reflection in its fourth chapter, “New Flock: Currents from Asian American Theology.” Here the reader finds expositions of Christian theological pillars like Revelation, Creation, Incarnation, Justification, Ecclesiology, and Pneumatology. Mihee’s main conversation partner in this unfolding is Reformed stalwart Shirley Guthrie (who’s Christian Doctrine was required reading for my “Basic Christian Beliefs” class in college.) Along the way she converses with a whole host of Asian American theologians you’ll probably be meeting for the first time: Boyung Lee, Anne Dondapati Allen, and Gale Yee, just to name a few. It’s an ambitious chapter well worth the effort it takes to read it carefully. Tucked neatly into her exploration of Pneumatology is a sparkling little defense of “syncretism,” a theological boogeyman of ages past. My seminary studies of the Christian missionary movements of the 18th and 19th centuries taught me that syncretism–the blending of the Christian gospel with elements from a “non-Christian” culture–was a crippling theological (and moral) fault. The syncretistic theologian “went native” and forgot his Christian (read: European/American) moorings. How refreshing, then, to read Mihee’s ode to syncretism. It’s the ultimate reversal. If syncretism = doom to American male missionaries venturing into, say, Korea in 1884, then syncretism = life for the female descendent of Korean immigrants to America in 2013. There’s an imperative to descriptive theological work here, over against prescriptive theological pronouncements. Yes please. Show us the way, Mihee. Show us the way. Note: Making Paper Cranes is a weekly engagement with Mihee Kim Kort’s New book . . . uh, . . . Making Paper Cranes: Towards An Asian American Feminist Theology. Mihee handles complicated things gently. Also, she’s deadly in the low post. Mihee recalls the warnings she received from the well-meaning elders of her home church, alerting her to the pagan dangers of “flaming leftist notions about women’s liberation.” I, too, received warnings like this, and nobody embodied leftism, feminism, and liberation more to me than Mihee. Now, I was a neophyte of the purest order, the product of Hellfire pentecostalism become hand-wringing evangelicalism become shoegazing emergence. The conventions of mainline protestantism were as foreign to me as haggis. So I had no reason not to assume that the Asian woman knocking people over in flag football games and striding confidently into theology lectures was a lefty feminist in Christian clothing. my experience suggests that within the subculture of Asian women, I am also fighting a cultural consciousness that favors a duty to society over the spirit of independence. Individualism may have been a Western male value, but at least it was a Western value. White feminists only had to democratize it; as an Asian feminist, I must introduce it. Asian society places a premium on social order and the advancement of the community. Here’s what strikes me about this. So much of the discourse that pulses through “educated” cultural circles (including mainline denominational gatherings) takes aim at “individualism” as an insidious force that has eroded a communitarian sense of responsibility to one’s neighbor. Yet, Mihee is holding up an experience, shared by many Asian American women, in which that communitarian sense often muzzles the individual voice, to the detriment of one’s neighbor. Ragging on individualism, then, is not enough. It seems those of us in the “dominant” culture need to be more clear about the kind of individualism we oppose, even while we look for ways to accompany our brothers and sisters who are working to cultivate a more holy individualism for their communities and, I daresay, for the church. Note: Making Paper Cranes is a weekly engagement with Mihee Kim Kort’s New book . . . uh, . . . Making Paper Cranes: Towards An Asian American Feminist Theology. Mihee handles complicated things gently. Also, she’s not afraid to turn upfield after the catch to gain extra yards. Seriously. That’s not a metaphor. The diversity of experience among “Asian Americans,” as Mihee deftly describes it, is staggering. As an Anglo American, I have almost no relationship to that diversity. Actually, that condition is only influenced by my own ethnicity, not conditioned by it, as the phrase “As an Anglo American” wishes to suggest. I’ve had opportunities. Doors have been open. Afraid, though, I’ve mostly stayed put and so stayed in the dark. Last year I participated in the ordination of a Korean American pastor. 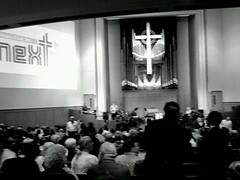 The worship service was entirely in Korean; my English recitations were foreign. It felt so wrong to me that the experience was so novel and that, as a minister in a presbytery where almost half the churches worship in a non-English language, being the only mono-lingual person in the room jarred me. Mihee’s identification of herself as “Asian American” for the purpose of inclusion makes this project more personal. It’s helping me to appreciate the wide array of Christians–Presbyterians at that– in my own patch of turf who share some aspect of what she’s describing. Take just one aspect of that experience: being labelled a “foreigner.” “I have always endured the question of whether or not I am a foreigner,” Mihee writes, even though she was born and raised in the United States. There are remedies available to soothe the discomfort of that question, but they come at a cost. This is hard reading, mostly because I’m not sure what to do with what Mihee’s saying. Perhaps she will have some counsel to offer later. For now I’m grabbing on to her exposition of the way American media stereotypes Asians, an expositions that leans heavily on the work of Franklin Wu. This is something I can pay attention to and work on. Toward an Asian American Feminist Theology is exactly what it says it is. 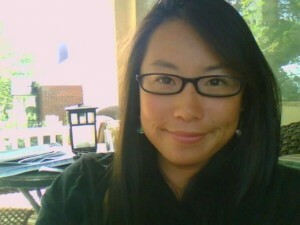 Mihee was a seminary classmate (and intramural flag football teammate) a decade ago. Since then she’s been a blogging partner and a contributor to PLGRM, the magazine I help edit. She’s a clear and honest voice. I’ll be blogging through the book over the next few weeks. A word about my method. I’m not an Asian American woman. My experience of this book is that of a white guy who knows and thinks highly of the author. That’s perhaps not the best draw for a book, but I think any author would take it. In reading Making Paper Cranes I’m trying to understand better my friend’s experience, as well as that of the many Asian Americans that make up the church in which I serve. Finally (and this is not that big of a stretch, is it?) I’m looking for myself. Growing up going to mostly Anglo schools in Colorado, I got along with anyone and everyone. My close friends were Anglo-American and African American, and I had one Latina friend. I had a few Asian American friends, but in terms of those who were non-Anglo, there were only a few of us. I never received any overtly violent gestures of racism but there were those typical cliché moments when a kid would chant at me in an annoying, singsongy way, speaking gibberish and asking if I understood it, or our class would get a new student who happened to be Asian but Chinese, and the teacher would ask me if I spoke Chinese and if I could translate for them. Every so often there was a breakdown of groups, whether for kickball teams at recess or for projects in class, and though I remember watching groups of white kids sit together immediately, and the black kids slowly congregate together, I would look around, wavering, trying to feel out where I felt I belong the most. I’m struck by the violence of these images. Hidden in that violence, though, is a loveliness trying to emerge. This is where the book gets its title and central image: the paper crane. Recalling her experience of folding cranes with her mother, Mihee describes the task as making “something delicate and lovely out of [an] intersection of creases.” There’s gospel in there. These collisions and their resulting fragments are all around, born by people I see every day. Half of the people I share a presbytery with don’t worship in English, and most of those are Asian. My experiences with them bear evidence of the kinds of collisions and fragmentation Mihee is describing. Clearly, I need to do more to understand them, to listen to them, and to honor their experience. I’ve known collision and fragmentation too. They seem to be markers of modern life. The variety explored in Making Paper Cranes is specific, and it produces specific effects that need to be heard and understood. In listening to it, I’m eager to pay closer attention to the creases, collisions, and fragments of my life to see, as Mihee has seen, what “delicate” and “lovely” things they offer. Read Bruce Reyes-Chow’s review of Making Paper Cranes here. Bruce Reyes-Chow and Company Are Planting A Church! Yes! Online? Oh . . .
One of the developments I covered in my Winterfest presentation on churches and social media is an online Presbyterian church start-up that was announced (hat tip: Lesslie Scanlon) last week by former PC(USA) Moderator Bruce Reyes-Chow. Peoples’ reactions were generally skeptical. Many were downright dismissive. And for as much as I quote Douglas Rushkoff and talk about how people in churches need to understand the biases of these digital technologies so that they’re using them in helpful ways and not unwittingly giving up their non-digital assets, I’m interested in this. I’m keeping an open mind about it to see what happens. Why? Because there are some seriously legit people behind it. Reyes-Chow is no Johnny-Come-Lately technophile; he held the highest elected office in a national denomination. And he’s not doing this alone. He’s gathered a team of Presbyterians: men and women, ruling and teaching elders, racially and ethnically diverse. Of that team, I know Mihee Kim-Kort and Steve Salyards (aka @ga_junkie) the best, and anything those two thought was worth their time and effort has immediate credibility in my book. Read Reyes-Chow’s blog post announcing the church here and explore their Facebook page here. Who knows what this could be? What are your expectations? Mihee asked for it, so here it is: my quick-and-dirty blog post about the NEXT Church conference in Dallas. Part the first. Terrific, outstanding, inspiring, exhausting: so much goes into a gathering for 600 people that nobody notices, and each one of those participants puts more into their time than they realize. I’ll be discovering the impact of it for weeks to come. An event review, though, is less interesting to read than a reflection on the event’s ideas. And the architects of NEXT don’t want, I’m sure, people talking about the plumbing of these gatherings as much as they do the people and the conversations inside of them. Some people can’t get past the plumbing: what was the racial-ethnic composition? ; was the music gender-neutral? ; what was the age breakdown? ; was there an organ? Plumbing is critical. But the only time you talk about plumbing is when it’s faulty. Some find fault with NEXT’s plumbing, likely for good reason, and yet I don’t wish to repeat the mistake of conference blogs past by jumping into the fray of that fault-finding, either to defend or confirm. Instead, I want to share the two most prominent ideas that I came away with. These ideas weren’t the subjects of workshops or sermons, but I heard them popping up in almost every conversation, and now I can’t shake them: prototypes and process modalities. The rest of this post will focus on prototypes; process modalities will get its own post later. Jud Hendrix described the work of the Ecclesia Project in mid-Kentucky as a search for prototypes of Christian community. “A prototype,” he suggested, “isn’t a program (I’m paraphrasing here). It’s a runway on which the future can land.” Further, a prototype is an instrument of learning. Another prototype I heard about is an intentional Christian community of young adults supported by Austin Presbyterian Theological Seminary. The community is made up of local Americorps volunteers, and the seminary’s role is simply to provide some spiritual and pastoral guidance to their life together, which is enabled through the use of seminary housing. It’s new and different, and the seminary is learning valuable things about ways in which different parts of the church can connect to the best yearnings of young adults. What are some other prototypes of ministry out there? What are they learning? How can Presbyterians be emboldened to create new ones and share what they’re learning with the wider church? Stay tuned for part 2 of my NEXT review (teaser: it’s heavy on Yehiel Curry and Theresa Cho). I was privileged recently to participate in a series of posts on Ecclesio called Theology as Art alongside Landon Whitsitt and Mihee Kim-Kort. Here’s my post in that series. First, though, here’s the link to Landon’s and Mihee’s posts. Actually, Landon’s post is an adaptation of a monograph he wrote, which you can purchase here. The assertion, “Theology is art” is as good a fault line as you’ll find dividing the splintered halves of what remains of Christendom. Recent events in my own denomination–the PC(USA)–are only the latest jolts issuing from the bad-tempered subterranean feuds over truth and authority that have caused all of western protestantism to walk lightly for the past three centuries. On one side of that apparently widening divide are the Jack Donaghys of the fold. They, like the fictional NBC executive from the sitcom “30 Rock,” see “art” as self-centered, indulgent, and hopelessly subjective and are far more eager to be guided by reason and ratings in their deliberations. Donaghy’s antagonists, TV writer Liz Lemmon and her cast of maladjusted writers and actors, is of course waving stupidly from the other side. I’m a partisan in that dispute, and my first name ain’t Jack, Jack. I am increasingly convinced that the Landon Whitsitts and the Mihee Kim-Korts of the church world are driving the caravan I want to join, even though there are other caravans to join, and even though these make better promises: of a re-polished establishment gauntlet; of relevance; of success. But as one who is continually being converted to a gospel that embraces doubters and exclaims “My Lord and my God!” at the spectacle of human weakness, I’m hopelessly attached to this rag-tag caravan of three-wheeled Schooners with their tattooed sails and artsy, bespectacled drivers. Hence my affinity for the proposition about theology being art, even though (or perhaps because) I don’t consider myself an artist. I just really want an artful theology. That’s what I’m after, really: theology done artfully. I guess if “Theology is art” is an argument in the indicative, then I want to give the “Let’s do theology artfully” pep rally in the imperative. And that starts by dealing specifically and confidently with artists. By “artists” I don’t simply mean those recognized as “artistic” for their superior technical skill or for their temperament or for their acute sensitivity. I do mean them, maybe even primarily them, but I also and completely mean everyone else. I mean each adherent of the Christian faith as a theologian and therefore an artist. If anybody should indeed care about an art-theology, then they must be made to care about art-theologians. We need to more and more situate the believing subject squarely in the center of whatever theological discourse is emerging. Claiming theology as art in a meaningful way probably means celebrating individual theologians’ experiential, limited, contextual, grasp of theology’s object, God, and not perpetuating anymore the modern preference for objective, dispassionate, propositional, wrapped-in-printed-text, discourse as more theologically reliable. Such an embrace of subjectivity as a reliable carrier of truth will alarm those for whom the rules and conventions of theology hold primacy of place. And with what I hope is seen as an artful posture, I want to embrace their alarm and allow it to set some of the terms of an artful theology. Because “artful” also means attentive to rules. An artful theology must be a conventional theology, and there’s no more critical convention of theology than the insistence upon talking about God. Theology is God Talk. That’s it. The moment we start talking about something other than God, the God Christians see revealed in the person of Jesus of Nazareth, then we’re not doing theology any more. And, yes, please God may he break them. May he break them without telling us he’s breaking them. May he surprise us, scandalize us, delight us, all by spurning those dictates of God-talk that he learned in the academy, not because he’s intimidated by them but because he owns them and can restrain himself from mimicking them to please the ghosts of his systematics professors. Improvise. That’s what I’m getting at. Artful theology is improvisational, which means that the artful theologian is one who is well aware that the discourse may get away from her. She knows that she’s not delivering a scripted monologue but participating in an unpredictable sketch about a milkman, a librarian, and a professional wrestler all on a boat together in the middle of an amusement park. Naked. Here a caution is in order. Improvisational does not mean unprepared. The best improvisational actors are the most practiced ones. They are thoroughly prepared. Even though everything they do and say during a performance is spontaneous, it all issues from a rigorous routine of preparation that involves lots of repetition and doing things uniformly and predictably. Finally, an artful theology will be a depressed theology, even a despairing one. The ear-severing Van Gogh will be more our model than the toothy-grinned Tony Robbins. Because art and theology both have to do with longing, and the artist or theologian who isn’t despairing probably isn’t longing. Exacting artists destroy more of their work than they display. This isn’t false humility or shrinking self-esteem, but captivity to unattainable standards of clarity, of depth, of rhythm of which we see only brief and fleeting glimpses. Which is maddening. And holy.